Photo 41. Kids who lived around Hulburd Grove , circa 1928-1929. 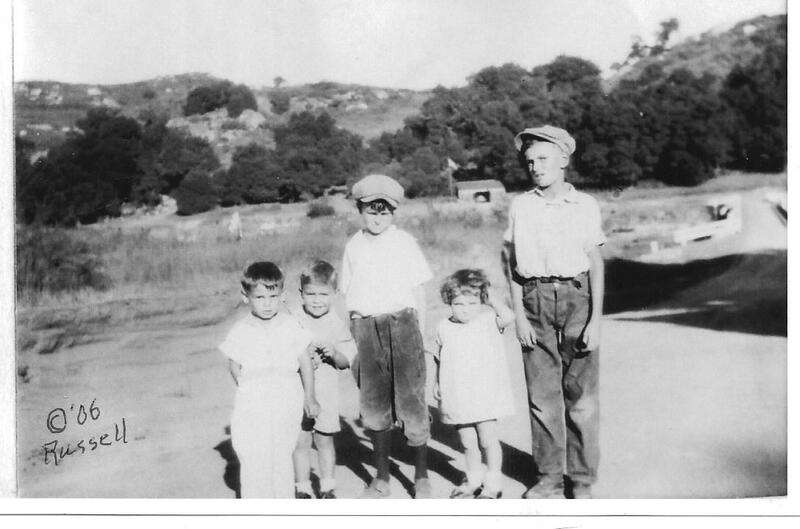 From the left are: Richard Cornelius, Don Russell, a friend of Howard’s, Barbara (Richard’s sister,) and Howard Palmer. Richard and Barbara’s folks had a cabin in the “National City Tract” down near Perkins’ Store. Don’s dad, Frank, was the “picture man and carpenter.” Howard’s father was Irving Lee Palmer, one of the triad who founded Hulburd Grove Guest Ranch and Hulburd Grove Estates. The background shows some of the estate homes. Photo 42. Don Russell on the running board of his Dad’s Willies Knight in front of their home in HE lots 74 and 75.Frank Russell worked as carpenter for the United States Forest Service. During major fires, he was a cook in fire camp. On One occasion, the car was used as ambulance for some burned firemen on a fire up in San Mateo canyon in the Orange County area. Note the spare tire cover. Photo 43. 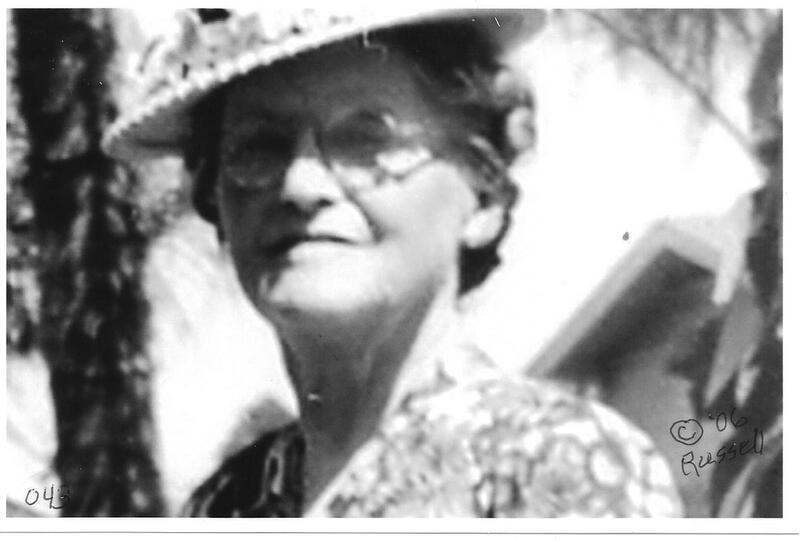 Inez Gorton, Descanso’s first librarian. When my folks moved out of the Imperial Valley in the late teens, they met and became close life-long friends with Inez and Warren Gorton. Prior to this time, the Gortons owned and operated the Oak Grove store that later became Perkins. Photo 44. Brawley, Ca. 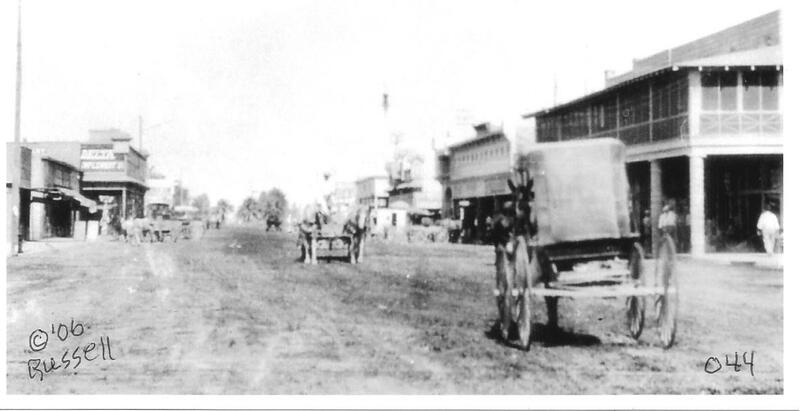 Main Street, Circa 1908. Photo 45. 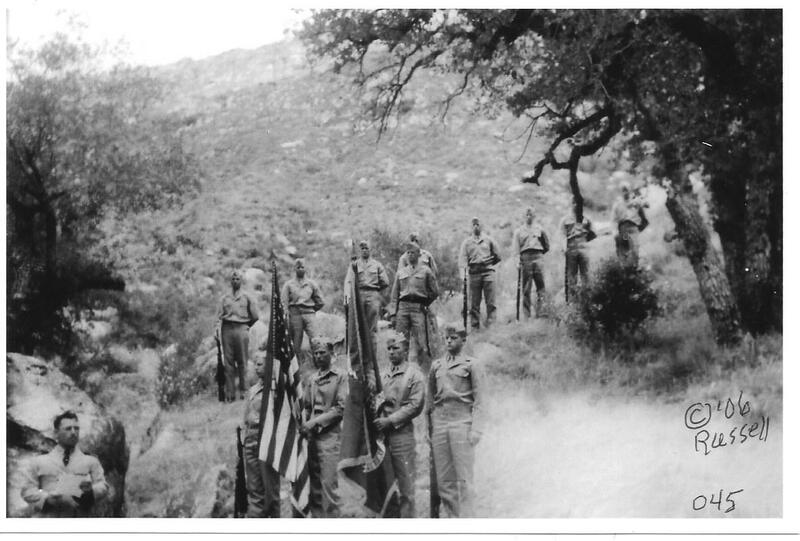 Marines holding memorial service for Marines who burned and died in the Hauser Canyon fire, circa 1943. Hauser Canyon was in the Cleveland National Forest, east of Barrett Lake and north-west of Campo. This happened during the WWII period when military crews worked on fires, because so many regular firefighters were in the military service. A monument stands on this spot to commemorate the terrible loss. 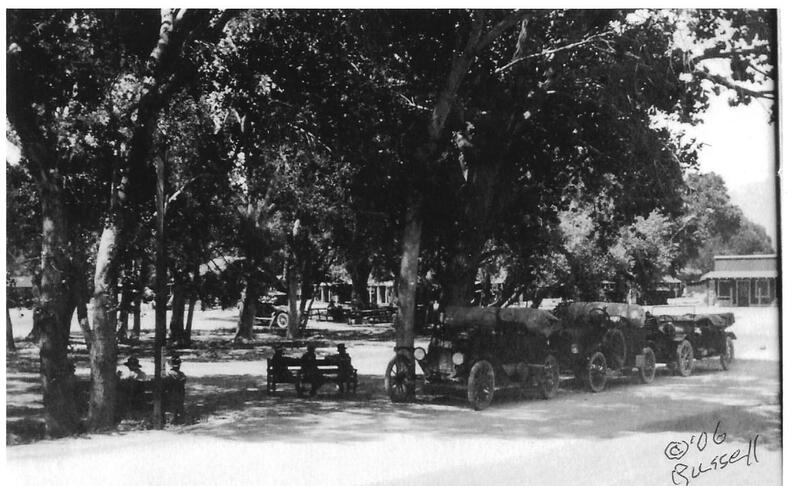 Photo 46.Jacumba – the cool rest stop along old highway 80, Circa 1920’s. Folks driving out of the valley in the early days would stop in Jacumba. There was a “Cool Drink Stand” just ahead of where these cars are parked. This was probably the second shady spot since they left home. The first was a spring with some small shade and water about two-thirds of the way up the “In-ko-pa grade.” The spring gave the name to Mountain Springs Grade. At the time, Jacumba had a garage, a four story hotel, cafes and resort surrounding two or three hot springs. 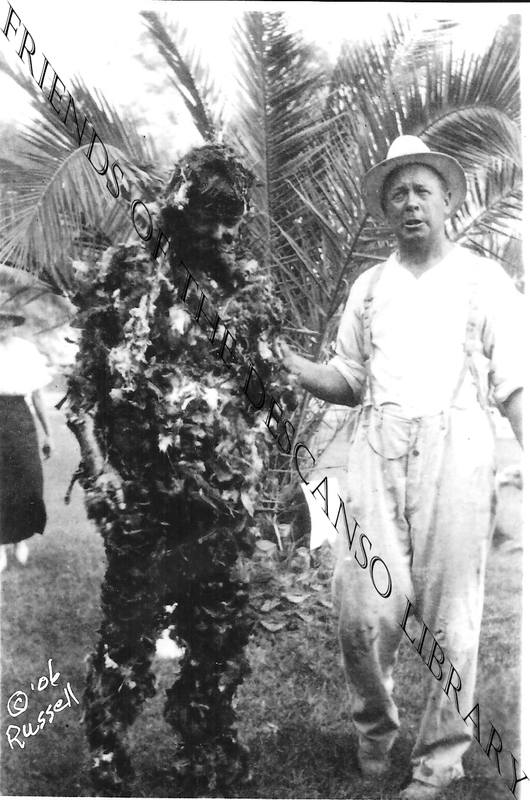 The man who was tarred and feathered in this historical picture was a fellow from Brawley, Ca., who openly backed the Kaiser during WWI. We've heard of people being tarred and feathered but never knew it happened. This picture is proof that this type of violence really occurred. 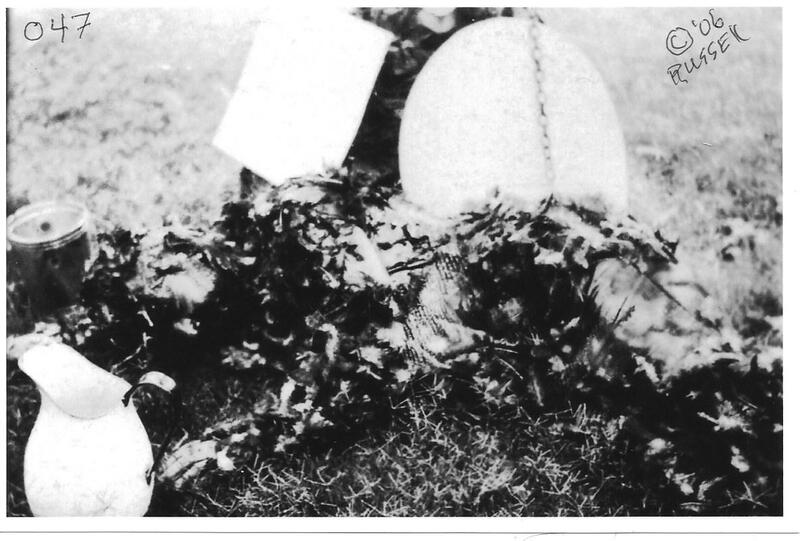 Few customers have bought the tarred and feather picture but many people express shock and surprise about the abuse. A high school teacher did purchase this picture to show his students that such events did occur. There are two other images of this same event occured. Photo 47. The man was pro-German and bragged about how great the Kaiser was doing. He was advised not to keep it up, but he continued. So he was tarred and feathered. My father Lewis F. Russell took this picture. Photo 48. The old Plank Road, circa 1950-1960. 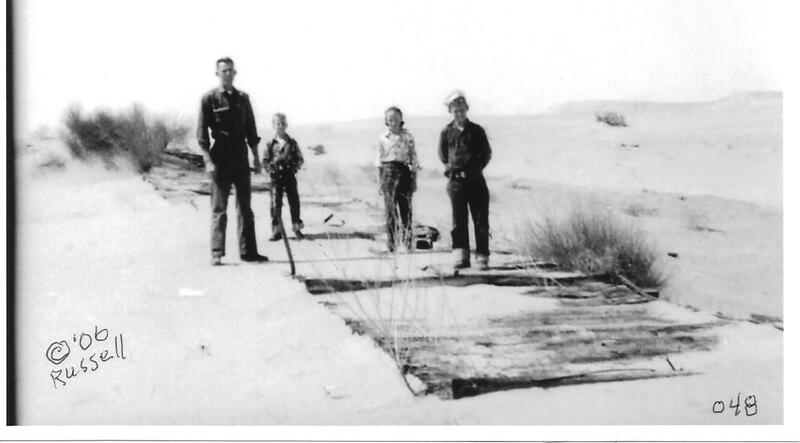 From east of Holtville at the edge of the sand to the east edge of the sand west of Yuma, Old Highway 80 was made from planks held together by metal straps, with periodic turn-outs for passing. Over the years, desert campers tore it up and used the planks for campfires. Photo 49. 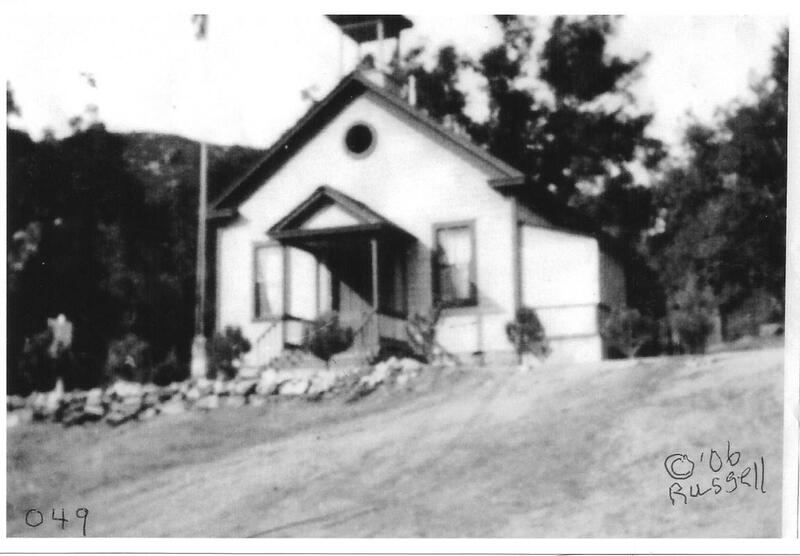 The second Grammar school for Descanso, circa 1930. The dead pines you see today (4/33/15) are those three foot high trees in the photo. Photo 50. 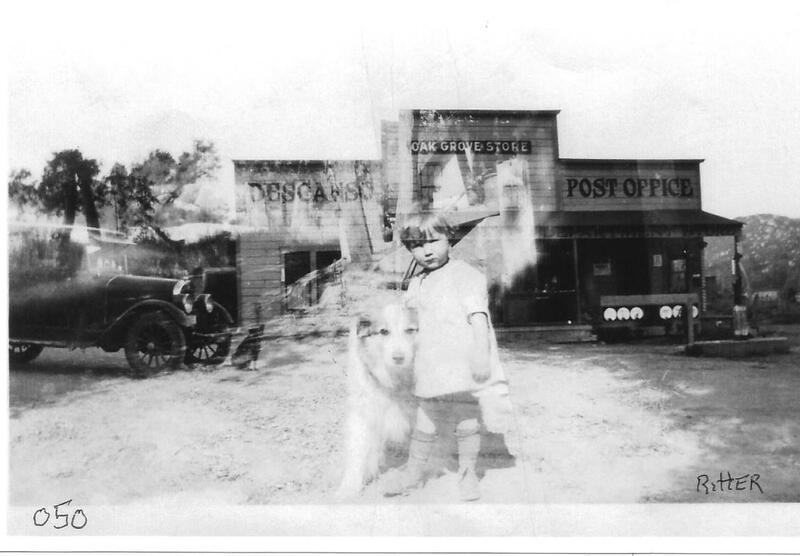 Stella (Ritter) Barrows in front of Perkins Store, circa 1930. 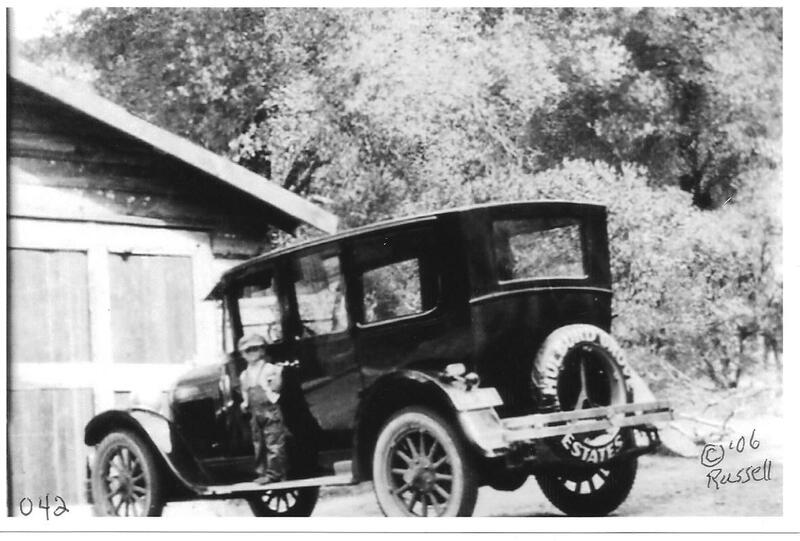 The Ritter family lived in Descanso for a long time, The Barrows worked for the United States Forest Service.